This post is part of our ongoing exploration of The 64 Arts. Either hand-operated or automatic, for raising water, measuring time, etc. You probably never thought of a screw as a machine unto itself, right? I know I never did. But each of these 6 simple machines form the (pardon the pun) building blocks for a lot of the more complex machines we rely on. A lever is a rod or beam that pivots around a fulcrum or point. Think a see-saw or crowbarÂ or the act of laying a log over a rock, with one end of the log tucked under the item you want to move. This simple machine allows you to lift or dislodge an item you might not be able to move without it. Baseball bats are also levers, the fulcrum in that case being your body, with your arms being an extension of the lever (if I’ve got my physics right, which I admit I might not… it was never my best subject). When an inclined plane spansÂ the gap between items on two levels, we can call it a bridge, a ramp, or a ladder. The angle of the plane makes it easier to cross that distance compared to non-angled methods (like walking up a ramp instead of climbing straight up the side of a building). Examples of wedges at work are easily seen in axes–they have a sharp edge and at least one sloped side so they can fit into (or make) a small fissure that they can then expand when more force is applied.Â Needles are wedges, but instead of pulling things apart permanently like an axe, they move things out of the way just enough to allow thread to pass through. Even our teeth are examples of wedges, breaking up food to make it easier to digest. 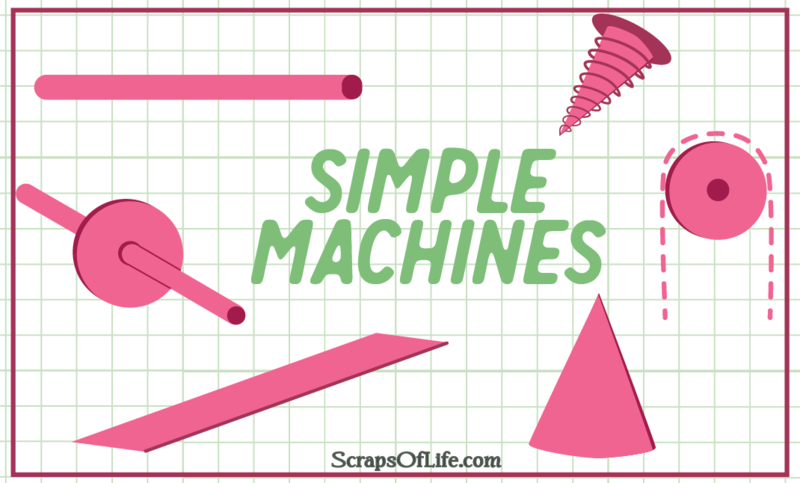 I consider those three the simplest of the simple machines. The other three are a tad bit more complex, but in light of the things they become, still operate on simple properties. The wheel is mankind’s best first invention, or so I’ve always been taught. But a wheel on it’s own only does so much. When you combine a wheelÂ with an axle (or, you know, a lever…), you build a machine that allows you to do more than just roll it around. Wheel and axle combos are probably the easiest simple machine to spot, but aside from the obvious ones, household items like doorknobs, rolling pins, and old school record players are based on the wheel and axle concept. A pulley is also a wheel derivative, this time employing a rope or chain along the grooved edges of that wheel to lift, lower, or move an object. Pulleys seem like they are what they are, they do their particular function just that good, and don’t need a lot of finessing to stand the test of time. If you think about it, though, a pulley is very similar to the lever but instead of a pole or beam, you’re using a rope, and the wheel becomes the fulcrum or pivot point. Finally, the screw. How is this a machine? It’s an inclined plane that, instead of being flat, wraps around a pole or shaft. Aside from the screw, itself, other screws as machines can be found if you look into the inner workings of a meat grinder, or even less closely at the lid of the nearest mason jar. And who can forget the all-important corkscrew??? With the bathroom renovation going on, we recently had a conversation about nails (which are wedges?) vs screws, and Todd allowed that screws were more secure in many instances–the rotating of that inclined plane bites into the wood, etc. and provides a secure grip to hold the two or more pieces in place–and easier to install (more people are likely to have drills than nailÂ guns, after all), but are often passed over because screws are more expensive. All of these machines exist to make work easier on us lowly humans. And work isn’t just what we do, it’s–on a scientific level–causing movement over distance by applying force. These six simple machines amplifyÂ the force we can exert on our own, travel a greater distance than we could on our own, and/or so it in a shorter amount of time. You know, it’s pretty cool that even back in the 4th century A.D., the powers that be recognized that girls* needed education in the STEM fields, such as they were back then! *There’s still some iffyness in who the list of the 64 Arts was intended for. Was it intended for all women in preparation for eventual marriage and home life (my vote, per the commentary I’ve read) or was it more for the women who would become concubines, etc. (a la the educational freedoms allowed to Italian courtesans in their heydey? qv The Honest Courtesan, based on the life of Veronica Franco, upon which the film Dangerous Beauty was based. ).